Undoubtedly, there are many places in Bangkok locals and tourists flock to when it comes to finding the right spot to dine and relax, in the busy Bangkokian atmosphere. Some choose to go to open markets such as Jatuchuk or Sanam Luang 2 while others tend to keep cool indoors, walking in big malls. However, it wasn’t until sometime ago a new venue opened: Asiatique: The Riverfront. Asiatique in respect is extremely different from any outdoor venue in Bangkok. Located by the Chao Phraya River which made it accessible by both car and boat, Asiatique boasts a nostalgic feel of Bangkok’s trading post past. Asiatique: The Riverfront is located by the Chao Phraya River which can be easily reached by a variety of transportation methods. The most common method is riding the BTS to Saphan Taksin station and catch a cheap boat ride to the venue. Reaching Asiatique, it does create a sense of nostalgia as this used to be a small trading post back in the past. Perhaps around in the early 1900’s when westernization was just touching Bangkok’s trading posts. To commemorate the Bangkok’s past; Asiatique has several bronze statues erected to show the lives of the people during that time. These statues are located by the harbour. Fast forwarding to the present, the entire location is decorated with fancy lights and shops lined in the hundreds in warehouses. These shops almost similar to Jatujak weekend market, contains various of items for sale: Clothing, tourist souvenirs, jewelry and sweets are just some of the items available for purchase. Most of the items, however, are hand crafted which makes them slightly expensive but worth the price. At Asiatique, there are a variety of restaurants which are worth mentioning. From Japanese to Italian restaurants, there’s a big assortment of dishes prepared by skilled chefs. Price wise, is slightly leaning on the expensive side but accompanied with amazing and well-prepared food, the price is just right. If visitors don’t want to pay outrageous amounts for well-prepared dishes then don’t fret; Asiatique has an open food court as well. The food court is simpler, yet refined. It’s refined in a sense of the area’s cleanliness, the positivity and friendliness of the staff and the food that’s served. Asiatique is one of the few places that shine at night. During some special occasions, the venue will host a tall, well lit Ferris wheel for couples and families to enjoy. 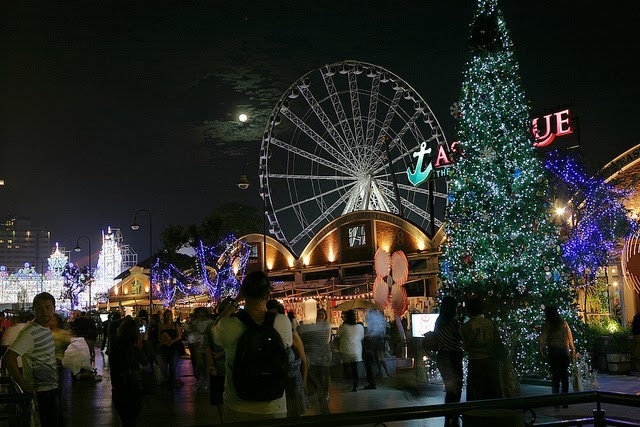 Asiatique: The Riverfront is a great place to hang out with friends and families. Not only does the venue contain amazing food, there’s amazing items to be bought or simply, people can chill out in Bangkok’s afternoon breeze. Perhaps what makes this place special is the calmness that surrounds the place. Not only does Asiatique allow people to escape the city, it allows its visitors to gather their peace of mind by eating good food and listening to live bands perform at Bangkok’s once famous trading post. Marisa Willis has been living in Thailand for the past 6 months. Her favorite place is Asiatique out of all the places she's visited in Bangkok. She is currenly residing at Pullman Bangkok hotel writing travel articles and Bangkok travel tips for online travel communities. Hello Alyona! Great Article! You visit Philippines too.